Having new firsts in the new year is always a good thing. And 2017 welcomed me to the gentleman's game. Covered golf for the first time ever and prior to that, I was completely clueless about the sport and the governing rules and regulations. Reading about it definitely helped, but no matter how much you know about it, nothing beats the first-hand experience. To sports junkies, golf can be pretty boring when you compare it with action-heavy sports such as basketball or football. And as a one-man team, following the leaders would be a good way to ensure that you meet assignment requirements. And because I had never stepped foot into a golf course before (don't judge), day one of the event was spent on understanding the environment, access, players, and things I can or can not do. I always make a mental note to take it easy and be patient and absorb whatever that I can. Time will make everything fall into place. As always, I'm grateful to the people around me - Maye-E, Wallace, Mark and Edgar, for sharing their knowledge and tips on covering the sport. Adam Scott of Australia throws his putter after missing a putt on the ninth hole during the SMBC Singapore Open golf tournament at Sentosa's Serapong golf course in Singapore January 19, 2017. 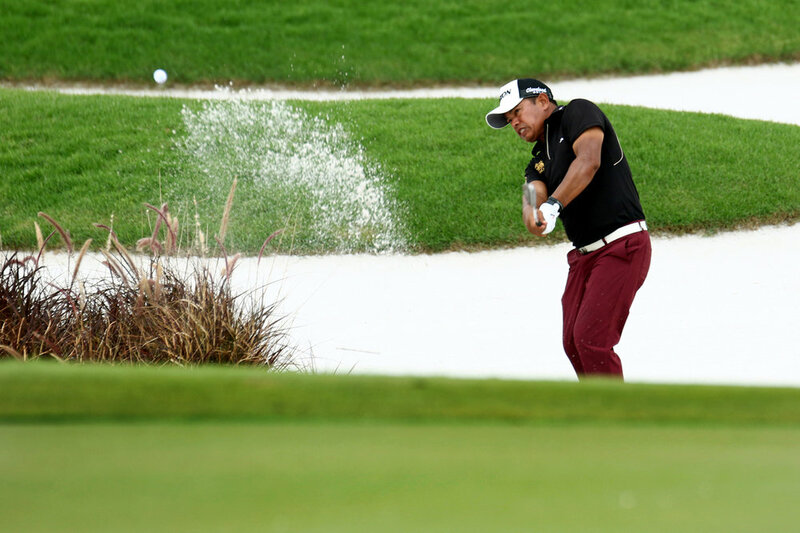 Prayad Marksaeng of Thailand hits out of a bunker on the fifth hole during the SMBC Singapore Open golf tournament at Sentosa's Serapong golf course in Singapore January 20, 2017. Adam Scott of Australia tees off on the seventh hole during the SMBC Singapore Open golf tournament at Sentosa's Serapong golf course in Singapore January 20, 2017. Adam Scott of Australia hits a shot on the seventh green during the SMBC Singapore Open golf tournament at Sentosa's Serapong golf course in Singapore January 20, 2017. Adam Scott of Australia tees off on the eighth hole during the SMBC Singapore Open golf tournament at Sentosa's Serapong golf course in Singapore January 20, 2017. Angelo Que of the Philippines and his caddy walk on the seventh fairway during the SMBC Singapore Open golf tournament at Sentosa's Serapong golf course in Singapore January 22, 2017. Angelo Que of the Philippines tees off on the ninth hole during the SMBC Singapore Open golf tournament at Sentosa's Serapong golf course in Singapore January 22, 2017. Song Younghan of South Korea hits a shot on the 18th green during the SMBC Singapore Open golf tournament at Sentosa's Serapong golf course in Singapore January 22, 2017.